﻿Las Vegas Purple Star Loyal Orange Lodge Sponsor Kirkin "o" the Tartan At City's Highland Games. For the Third year in a row, Las Vegas Purple Star L.O.L. have sponsored the Kirkin " o" the Tartan Service . This was held at Floyd Lamb Park, North Las Vegas, with The Rev. Dr. Jim Reid officiating the service. This follows the Nevada Day parade where members in kilts walked with the Las Vegas Highland Society, expressing our rich cultural and religious heritage. Protest banner being delivered to Twaddell Avenue, Ulster. Two members of Las Vegas Purple Star L.O.L. 212, delivered a protest banner to fellow Orange Brethren and Sisters at Twaddell Avenue, North Belfast, Northern Ireland. The protest is against restrictions to assemble and parade, placed on the Orange Order in Northern Ireland. Las Vegas Purple Star opposes these restrictions and support civil and religious liberty for all, regardless of politics, race, culture or religion. This banner of solidarity across the 'Pond' is still proudly displayed at the protest encampment. Bro. Rev. Dr. Reid conducted the invocation as Veterans were honored at Boulder City Memorial Day ceremony. Bro. 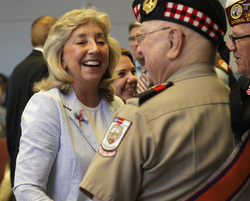 Reid, a retired Marine chaplain and member of Las Vegas Purple Star LOL 212, led the prayers in the presence of the Govenor of Nevada and many other Federal and State officials. Bro. Reid said " It was an honor to lead the religious element of the service to remember not only our fallen but to remember the loved ones left behind. Freedom is never free and we must thank God for his providence and the sacrifice good men and women have made." LAS VEGAS REVIEW-JOURNAL Raise your glasses, shout out cheers and sing a British pub song — the royal family got 8 pounds 6 ounces bigger on Monday. No one knows his name or what he looks like, but His Royal Highness Prince “insert name here” of Cambridge might be the most famous baby in the world. Third in line for the throne, the smallest prince was born Monday afternoon to the Duke and Duchess of Cambridge, Prince William and Kate. The youngest royal has sparked celebration throughout parts of the world, and the Crown & Anchor British Pub on Tropicana Avenue near Maryland Parkway and the Little Crown & Anchor on Spring Mountain Road near Decatur Boulevard are jumping in on the joyous occasion. “There is a tradition in England after a baby is born,” Crown & Anchor owner Ron Schultz said. “We’re going to ‘wet the baby’s head.’ In the old days, they didn’t have phones. They would go down to the pub, and that’s how information was shared.” Wetting the baby’s head is a celebration of new life with a pint of ale at the local pub. The Las Vegas Purple Star, Loyal Orange Lodge No. 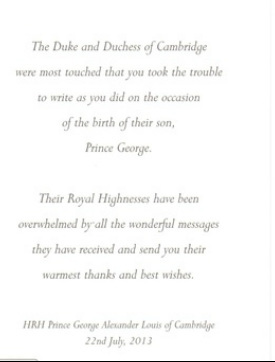 212 also sent out a statement toasting the birth of the royal heir. The organization, the Loyal Orange Institute of the United States of America, is a religious fraternity that comes together to ensure that civil and religious liberty is maintained, according to a press release. In a letter addressed to the blossoming family, congratulations were extended. “We recognize the significance of this occasion for our Orange brethren in the United Kingdom and the British Commonwealth, and as brothers, we wish them every joy in their celebrations today,” Lodge No. 212 secretary Richard Dallas wrote. June LeMay, general manager of the Crown & Anchor pubs, found out about the royal heir in a morning phone call with her mother in London.